Headlights were a surprise treat at Corndogorama this year: a very fun touring band that i had never heard of. I enjoyed their set so much that i picked up this CDR EP from the band for a couple of bucks. It has proven to be a worthwhile purchase. 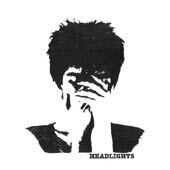 Headlights are a three piece band with male and female vocals. The female vocalist also plays a nice keyboard from which she coaxes a wide range of sounds. The male vocalist plays guitar through a lot of distortion in an almost shoegazery way, and also adds bass at a few points. The drummer does a really good job of tying it all together. The first song here is called Put Us Back Together Right, and it might be the standout as well. It starts with an instrumental piano bit accompanied by female voice. Then the drums and guitar join in, the male voice duets with hers, and the whole song becomes insanely catchy. The guitars are really nice in this song, chiming and echoed, a perfect accompaniment to the piano driven melody and the harmonious vocals. Headlights follow this up with Lullabies, which is a slower song, more melancholy, and, well, lullaby-like i guess. Anyway, the male voice sings this one, and although he is not as captivating of a singer as the female, he does a fine job. This song is nice in that it gets very orchestral in the middle. Next is the cleverly titled Songy Darko, on which the keyboards get switched to "organ mode" and the female singer speaks her parts in a vaguely breathy manner that reminds me of the work of Stereolab. A nice bass riff drives this song along, and the guitar swells up in the middle to a real shoegazer frenzy. I also like the scattered, sparse drumming. This is a really nice tune. Finally they end with Signs Point to Yes But Outlook Not So Good, a song about Microsoft email products failing. No, i kid, i think the title is taken from one of those Magic 8 Ball things. Anyway, a synthesized beat chugs along to start this one out. It is joined by distorted, echoed guitar, male voice, and then the female singing harmony. They sound really good together, and i think that the times when they are both singing are the strongest moments on this EP. This song gets really big sounding, with a nice deep bass riff, guitars that echo like something from mid-era U2, energetic keyboards, and spastic drumming. Another fine tune. In fact, there are no clunkers on this EP. Headlights have put out a solid little EP with 15 minutes of quality listening. This is really solid pop music, and i look forward to hearing more from this band. Headlights played on the final day of Corndogorama 2005. According to their website, the band has recently remastered this EP, and has it available for sale again.